Mathew Moresby : Surfboard Riding, Pitcairn Island, 1852. Matthew Moresby: Surfriding on Pitcairn Island, 1852. Pitcairn; the island, the people, and the pastor, with a short account of the Mutiny of the Bounty. 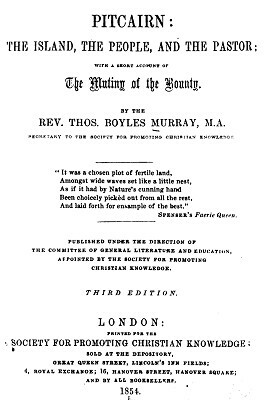 Society for Promoting Christian Knowledge, London, 1854. In August 1852, HMS Portland Portland under the command of Rear-Admiral Fairfax Moresby landed on Pitcairn Island. One of Moresby's sons, Matthew Fortescue (known as Fortescue or 'Forty’), was aboard serving as the Admiral's Secretary and he described the islander's surfing skills. During this period he visited Pitcairn Island several times and enjoyed 'taking walks over the Island, sketching, talking and singing’. He became very fond of the Pitcairners: 'truly a more innocent and delightful race could not exist’. Surfing was brought to Pitcairn by the native women who accompanied the mutineers from HMS Bounty when it fled from Tahiti in 1789. Surfboard riding, on a flat board about 3 feet long, on the upper side smooth and on the under a ridge like a keel, was first reported by Dr. Ramsay in 1821. Thirty years later, Morsbey's description, a piece of wood about three feet long, shaped like a canoe, with a small keel, is essentially identical. The small keel appears to be a design feature intended to give the board directional stability, commonly known as a skeg or fin and is usually accredited to Tom Blake in 1935. This feature is not recorded in any of the reports of traditional surfboards of Tahiti or the Hawaiian Islands, it is likely that the Pitcairn board was developed in a combination of the Tahitian's native design and the European seaman's knowledge of boat building. 1821 Dr David Ramsay : Surfriding on Pitcairn Island. 1834 Frederick Bennett : Surfing on Pitcairn Island. 1868 Mrs. Selwyn : Surfriding on Norfolk Island. Extract from a letter from the Admiral's Secretary. "At 6. 30, A.M. of the 9th, as we were dancing along about eight knots an hour before a fresh breeze, we discovered a thin blue shadow, whose outline appeared to be too well defined to be a cloud: at 9 we were certain that we saw Pitcairn's Island. perienced a feeling of something (I know not what to call it) on approaching the island, that I have felt when visiting some spot held sacred either from history or from being the scene of some Biblical relation; it is a secret kind of satisfaction. Having a fair wind, we hoped about noon to be on shore; but whilst we were yet twenty miles from the island, the wind came directly foul, and fell light, so that we hardly held our own, owing to the heavy swell, and all day we remained endeavouring to work up. What a little spot it appears on the vast Pacific! a mere rock, apparently incapable to resist the mighty waves of so vast an ocean. Easily indeed would a ship not knowing its exact position miss it. The mutineers might well deem themselves secure on so small an island, so remotely situated at that time. Also these seas were but little frequented; but even now, to give you an idea of their vast extent, notwithstanding the thousands of ships that are trading on them, we have only seen one ship at sea, and out track measures 4,500 miles. When we get close to the land, or some well-known port, we see a few. During the night we got a slant of wind, and at 6, Sunday morning the 8th, we were close to the island. The Admiral fired a gun to give notice of our arrival. or eight fine, tall, robust fellows, and gave us a hearty shake-hands, and assured us of a hearty welcome when we went on shore. "I was in my cabin with Philip M'Coy, one of the islanders, when the sentry came to tell me that it was prayer-time, for the admiral always has prayers before breakfast. On going down, we met the rest of his companions, whom he told, and they all came in and knelt down to prayers. We then got a hurried breakfast, and the admiral and myself immediately landed in the cutter, the water being pretty smooth. violence on the rocky shore. The proper way to land is to come to the back of the rollers in a ship's boat; a whale-boat then conies off, you get into her, and she immediately gets ready to obey the signal of a man who stands upon a rock on shore, and directly he waves his hat, the favourable moment has arrived, the men give way, and with wonderful rapidity the boat is borne on the top of a wave to the shore. They are very skilful, and in a heavy surf will generally land you dry. Boys and girls can swim almost as soon as they can walk; consequently they can swim through the largest surf, and play about amongst the broken water on the rocks that we look at with terror. One of their greatest amusements is to have a slide, as they term it; that is, to take a piece of wood about three feet long, shaped like a canoe, with a small keel (called a surfboard); they then, holding this before them, dive under the first heavy sea, and come up the other side; they then swim out a little way until they see a rapid heavy sea come rolling in, the higher the better; they rest their breast upon the canoe or surfboard, and are carried along on the very apex of the surf at a prodigious rate right upon the rocks, where you think nothing can save them from being dashed to pieces, the surf seems so powerful; but in a moment they are on their legs, and prepared for another slide. sea, they run in and try to pick the squid up before the advancing surf can wash them off; but frequently they are washed off, and then they have to exert all their skill to land, for they have no surfboard to help them. with a short account of the Mutiny of the Bounty. Geoff Cater (2016) : Matthew Moresby : Surfboard Riding on Pitcairn Island, 1852.